If this is the first time you’ve heard of the module and want to learn more check out our two part series on using Webform. This is part of the Webform module, so I’m going to assume you have it installed. If you’ve never installed it check out our “Getting Started with Webform in Drupal 8” tutorial. 1. From the Webforms page, go to the Build page of any form by clicking on Build. 2. Then click on “Add element”, search for “select” and click on “Add element” on the Select row. 3. Enter in a title for the element, you could call it Day. 4. From the Options drop-down, select Days and then Save. 5. If you view the form, you should see a drop-down called Day with days as the options. You just saved yourself the effort of manually filling out the days. To manage all the predefined options go to Structure, Webforms, Configuration and then click on Options. From this page, you can view all the options create custom options and modify existing ones. Let’s now modify the Days options so that Monday is the first day. 1. Click on Edit on the Days row. 2. Reorder the options so that Sunday is at the bottom then click on Save. 3. Now if you view the form, Monday should be the first option. Take note, if you’re using the same predefined option on multiple elements and change the options (like we just did), then the change will appear on all elements. Creating your own predefined options is very easy. 1. While on the Options page, click on “Add options”. 2. Give your options a label and some values, then click on Save at the bottom of the page. 3. Select your predefined options from the Options drop-down on a select or checkbox element and you’re done. The editors and marketers who use Webform to create custom forms will love this functionality. 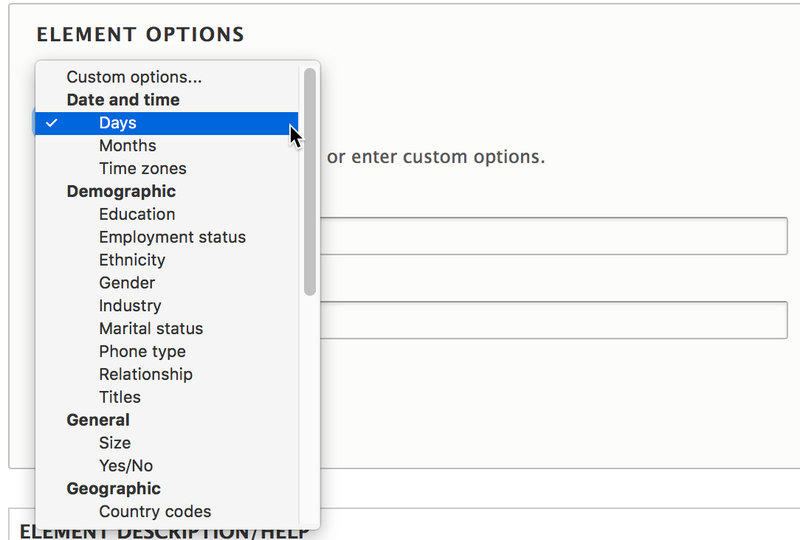 Out-of-the-box it comes with a bunch of common options such as days, months, “time zones”, “country codes” and more. On top of that you can create your own custom options which’ll save you a lot of time in the long run. Hello, Ivan. I am teaching a beginner’s Drupal 8 course at Austin Community College. May I link to some of your resources? Yes you can link to some resources. What if I want to load an new predefined element that contains hundreds of values? is there a simple way to load them instead of writing each key value per? 1. Create the predefined list with a few options and export the config. 3. Then just import the config change.